This entry was posted in Salads (Insalati), Vegetarian and tagged Couscous, Food, Italian, Recipes, Salads by ChgoJohn. Bookmark the permalink. LIDIA RULES! I thought only all caps would convey how much I love her. I also love the idea of a pasta that plumps while it marinates. This just looks really fresh and fantastic. But back to Lidia, whenever she’s on TV we stop and watch. But you know I don’t think I own one of her books. This must be remedied. I couldn’t agree more. There is only one Lidia and I love everything about the woman. There’s an authenticity about her and her recipes that few chefs possess and my DVR is set to record her show whenever it’s broadcast. LONG LIVE LIDIA! Who loves you, Jack? I do! Aw, thanks, Dear. I knew this recipe would catch your eye. Give it a shot; I’m sure you’ll approve. I’ve made versions of it over the years, but you’ve reminded me of how good it is and given me some new ideas, too. Grazie, baybee. I always knew couscous was a quick dish to prepare, but you’ve made it even easier… I did not know it could simply marinate to tenderness! This will be a great dish to prepare before work (yes, I remember your comment that you Don’t Work, but some of us do!) and truly, the possibilities are endless to mix into this wonderful salad. I hope my attempt at a joke didn’t offend, Linda. I’m disabled and don’t work currently — but I’ve not forgotten what it’s like to come home on exceptionally hot days and have to fix dinner. Make this salad in the morning and let it “cook” all day long in the fridge. As for the recipe itself, the only thing you need to be careful about is the amount of liquid needed to hydrate/cook the couscous. So, if you choose not to use the canned tomatoes, you’ll need to add some other liquid to make up for the fluid loss. Oh, not offended at all…maybe jealous! And I’ll be there to check it out when you do, David. Can”t wait! Oh, and you didn’t even need to boil the water. That is wonderful! I love you above suggestion about letting the couscous plump up while away at work, coming home, browsing what’s in the garden, a little knife work, and dinner! It sounds so perfect…. A glass of chilled rose`….. I have a batch in the fridge right now that I made this morning with the vegetables I bought yesterday at the farmers’ market. Since no cooking is involved, it really is a one bowl dish and perfect for the “dog days” that lie ahead. Love couscous and love couscous salads! Perfect meal for the heat you are experiencing – sadly we are on the other end of the scale – I will swap you any day. Ah! The grass is always greener … I try not to complain too much about the heat for I know that in 6 months I’ll be cursing the cold as I use a snowblower to clear my front walkway and that of my neighbors. I’ll probably blog about casseroles on those days. 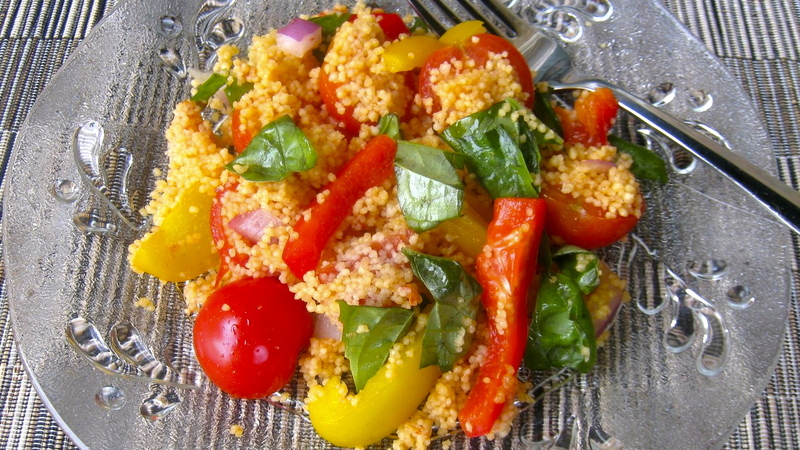 Yummy, this couscous salad looks absolutely amazing, and perfect for the heat of the summer. I know it’s been very hot here as well, and with that said my appetite isn’t the greatest! My appetite is much the same as yours and that’s why I love this salad. It’s light and fresh-tasting, the perfect appetizer for the dish of ice cream I’ll eat to try to cool off. I love coucous!!! Thanks for this easy and tasty recipe!!!! Bravo, including tomatoes with their juice is such a clever idea!! We’ve had some exceptionally warm weather and recipes like this one that don’t require any cooking are heaven-sent. I’m glad you enjoy it and thanks for stopping by to comment. I know what we’re having for supper tonight! Your salad looks tempting and delicious! Truly, this is a favorite of mine and I rely upon it whenever the weather really heats up. I hope you, too, enjoy it and thanks for stopping by. I’ve been looking for something like this for my lunches. Easy and refreshing, no warming or cooking. I work from home, and even warming up leftovers can seem too much at times. Thank you!!! This salad is tailor-made for someone who works at home, Angeline. Take a few minutes to assemble it in the morning and it will be ready and waiting for you at lunch time. 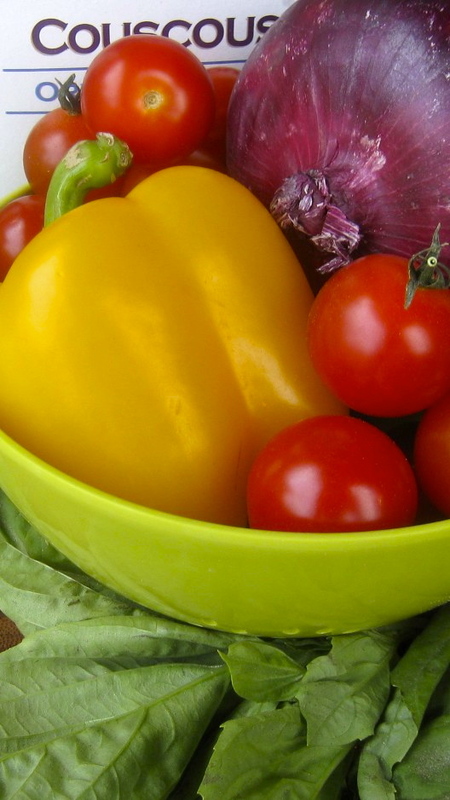 It’s a great way to take advantage of the produce at our farmers markets. And no cooking required!!! Gosh, John, this is really an interesting idea! I’ve never thought of not cooking couscous before. I’m pretty familiar with it – I lived in Morocco for a bit just out of college, and couscous is on many tables every Friday for lunch (the Muslim sabbath). I’ve seen it being made countless times – really labor intensive! But never saw it eaten “raw” (I realize the marinade rehydrates and tenderizes it). Fun recipe – definitely something I need to try. Thanks. I’m so glad you enjoyed the post, John. It must have been fascinating to live in Morocco for a spell. I’ve seen couscous made on a couple of cooking shows and, as much as I enjoy making pasta, this is one I’ll leave for others to make. Great recipe John ! I’ve never seen a recipe quite like it – “pinning it” !! Hi John – I think we’ve finally gotten to the bottom of my “tummy” troubles…. and it stems back to 40 years ago, when “little old me 5′ 3″ me” gave birth to twin boys. My next step is to find another type of surgeon and, hopefully, I’ll be back to being the bouncy me again soon! I’ve had a pasta and Italian bread recipe all ready to go for about a month – I’m gonna post it tonight!! And hopefully I’ll be getting back to posting regularly soon! I hope you have found the cause and the new surgeon will be of help. I don’t know how you women do it. Seriously. If men got pregnant Mankind would not have made it out of Eden. Looking forward to your new posts and seeing you more often. You really have been missed. Hope you’re feeling better soon! LOVE this salad!! Although can’t I use all fresh tomatoes rather than the canned? I’m sure you could but you have to be careful. The tinned tomatoes have quite a bit of liquid and that’s needed to hydrate and flavor the couscous. If using fresh, you’ll need very juicy tomatoes. I don’t think plums, for example, would work. I’m glad you enjoyed it, Colline. It’s a Summer favorite of mine. Thanks for coming back to let me know. Have a great weekend! I must try some of your other recipes John, especially the pasta ones.